Especially if you grew up eating a bowl of Cheerios for breakfast. As a nursing mom it’s important for me to get my calories and proteins in every meal. I have to make it count. So this is a breakfast that does just that. It’s delicious, savory and fairly easy to make. This dish calls for blanched broccolini. I like to keep blanched broccolini in my refrigerator so I have it on hand when making dishes like this. The steps to blanch broccolini are simple. Think of the steps you take to make pasta, only this calls for less time in the boiling water. You can add salt to the water of you desire. Cook time is 3-4 minutes for these veggies to get tender. Strain your broccolini and run under cold water before storing in the refrigerator. I use a Japanese rice cooker to make my brown rice because it’s easy and fool proof. I like to keep cooked rice in my refrigerator as well so I just have to heat it on the skillet when making dishes like this. Alas, this is a two pan breakfast. In one pan you will have water with two cap fulls of apple cider vinegar boiling to poach your farm eggs. In the other you will have olive oil and crushed garlic heating up where you will sauté your blanched broccolini and warm up your rice. Once your garlic is sautéed in the olive oil, add chopped broccolini and rice. Cover the pan with a lid. In the small pot with boiling water and apple cider vinegar add your farm eggs with the shells ON into the water for 30 seconds. Remove the eggs. Crack open the eggs directly into the water and let cook for approximately 4 minutes or until yolk is cooked to your desire (less time in the water means a runnier egg). Remove the lid from your sauté pan and stir your veggies and rice to ensure ingredients are getting heat on all sides. Once your eggs are done remove them with a small strainer or slatted spoon and place on a paper towel so excess water can be absorbed into the towel. 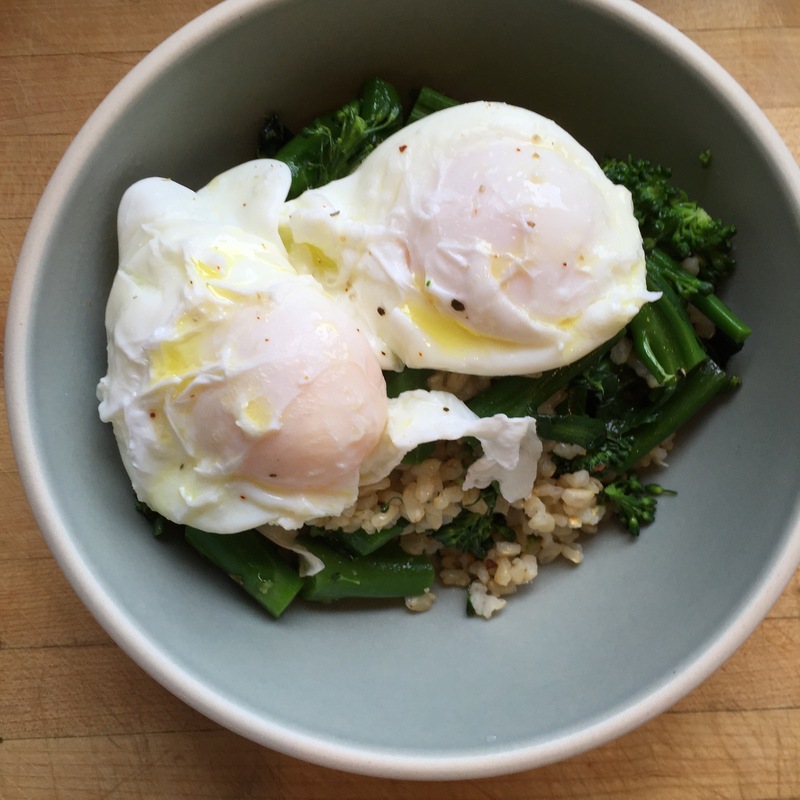 Serve the sautéed rice and broccolini in a bowl. Top with the two farm eggs. Drizzle with olive oil, salt and herbs. Can drizzle balsamic vinegar if desired for taste.